The next day was a little more laid back. Don and Mary flew a kite while Molly tried to catch it. We all went for a walk on the south end of the island and enjoyed long views and watched birds and seals. Back at camp our friend Kim arrived with her boat and we had a lovely afternoon paddle before dinner. Do you know what kind of gulls they are? We spent last week at Lost Lake in the Okanogan Highlands in eastern Okanogan County. If you’ve followed this blog for long, you know we go there just about every year. What is it about this place that we find so inviting? Let’s see: old growth western larch forest, Common Loons, wildflowers, historic CCC structures, peace and quiet, wildflowers, perfect small lake for paddling and relaxing, brook trout in that lake, good birding and much, much more. Weather was kind of chilly and we enjoyed our campfires each night. Fishing was off from other years but Ken was able to bring in enough for two meals. A friend joined us for a couple of days. We did some serious birding and she got to paddle Ken’s fishing kayak. The dogs were happy and busy and they slept like rocks each night. I think we all slept well with the frogs in the background. We woke to singing Swainson’s Thrushes and Ruby-crowned Kinglets each morning. Luna waited patiently while I crawled around looking at the wildflowers. Last week Ken and I and the dogs got away from home for a few days. Whidbey Island was our destination. Whidbey is over 50 miles long and lies at the north end of Puget Sound, otherwise known as the Salish Sea. 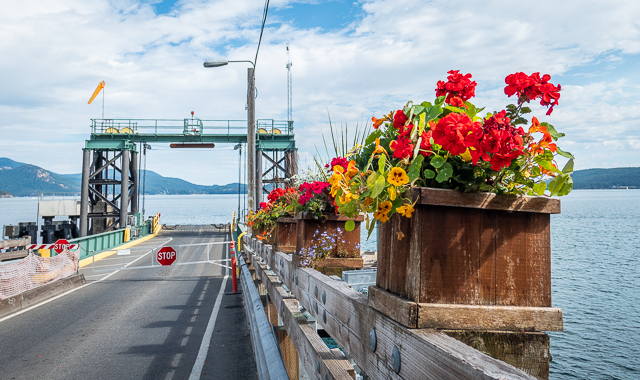 You get there by taking a ferry or by bridge across Deception Pass at the island’s north end. We took the bridge. It’s a good place for beach walking, exploring small towns and history and eating good food. We did all that and I got to take my kayak out in Penn Cove (where they grow the wonderful mussels) with Ken’s brother. We camped at Fort Ebey State Park in a beautiful forested setting. It was a short walk to a bluff trail that provided wonderful views of the strait and good birding opportunities. It’s part of a large system of trails for walkers and mountain bikers. Fort Ebey is one of a series of forts that were constructed for coastal defense beginning in the 1900’s. Several of these installations were converted to state parks in the 1960’s. The dogs had a great time on the beaches and the sunsets were marvelous. Driving across the pass we enjoyed the first dusting of snow in the North Cascades and a walk in the big cedar trees along the Skagit River at Newhalem. Mt Rainier and a ferry. Birds use the kelp bed as a platform to hunt for food. This noisy parachute with a lawnmower engine was quite the disturbance. All the birds flew. Luckily, he didn’t stay too long. I’ve been visiting Lost Lake for nearly twenty years now. From the first time, I remember the loons. It was news to me that there were Common Loons in Washington. And then I realized that they were nesting here too! Lost Lake is a small lake so it only hosts one nesting pair. There are a few other lakes in eastern Okanogan County and also in Ferry County that support a small population of nesting loons. Loons face many obstacles to raising their babies. Both parents take turns on the nest so the eggs (often there are two) are never left exposed. Predators that could take them include Bald Eagles, Common Ravens and otters. After they hatch and the young birds are on the water, the parents are constantly wary of attacks from the air and the water. An eagle can easily take a young loon from the water’s surface. Loons aren’t the only birds at Lost Lake but they might be the most charismatic. Lots of people fish there in non-motorized boats so the birds are accustomed to boats and will approach fairly close. They are especially interested in the anglers. I find that if I sit quietly in my kayak, the birds will come close and offer great looks. Not that close though. These photos were mostly made with a 600 mm lens. The forest bird photos were made with a much shorter lens. Spotted Sandpipers are a real joy to watch. They trot along logs and sticks on the water, bobbing their tails up and down and issuing their calls when they fly to the next lot. There are lots of swallows around the lake, taking advantage of many of the cavities in the trees for nesting sites. Unkown Empidonax flycatcher. Any thoughts on its ID would be appreciated. It did not call or sing as I observed it.